I celebrated World Book Day 2017 by making a book with children at the Evelina Hospital School. This remarkable school caters for children who have to stay in hospital for a long time, and miss out on going to their regular school – it’s a lovely warm and friendly place with very small class sizes and lots of 1-1 teaching. The project began with a morning on dialysis ward, where some of the children have been spending three days a week since they were born. Using a mix of drawing and collage, I helped the children create some beautiful rainforest creatures – my favourite is the rainbow jaguar, invented to represent all the undiscovered species in the rainforest. I also visited other wards, and spent a day in the classroom working with some children who were well themselves but had very sick siblings, so the whole family was living at the hospital. One little girl produced the fabulous treehouse below, complete with a family of five! The work the children produced was wonderfully exciting and vibrant, and I have put it all together into a hand-bound book for the school to keep, use, and exhibit in their summer show. You can read the school’s report on the event here. This entry was posted in Books, collage, drawing, Workshops on March 5, 2017 by Jane Porter. With secret doors, knobs to twiddle and control panels galore, this harvest ‘machine’ was the focus of a Big Draw activity I organised recently for a lovely local community event, Southfields Harvest. This year’s Big Draw theme was STEAM Powered – bringing together Science, Technology, Engineering, Art and Maths. Children drew fruit and veg to drop in the hoppers at one end, added dials, switches and various secret ingredients through the little doors, and then created some imaginative finished products to appear in the ‘output’ hatch. 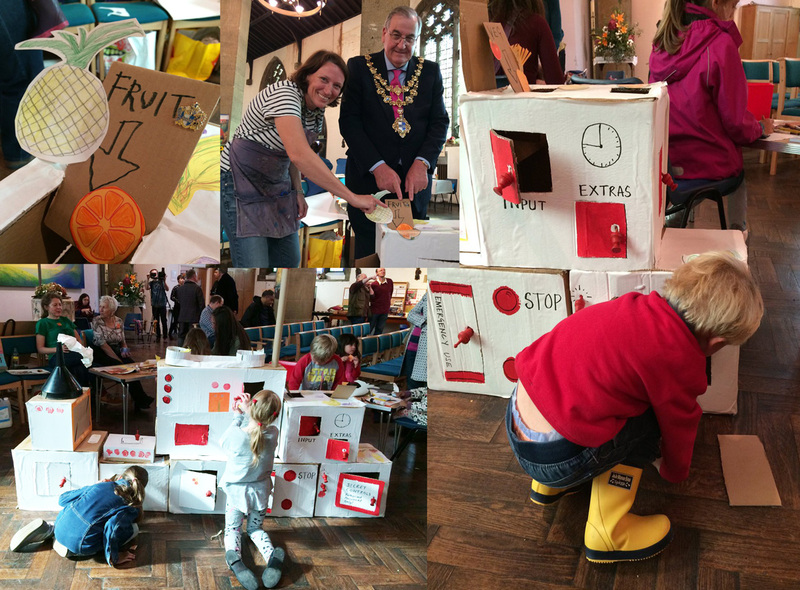 The doors in particular kept many little fingers busy for much of the afternoon – and even the mayor dropped in to participate. Many thanks to Southfields Harvest, and to St Barnabas Church for hosting the event – and also to Work and Play scrapstore for plenty of paper and the rather classy doorknobs. This entry was posted in drawing, General news, Workshops on October 3, 2016 by Jane Porter. I’ve just finished a project for Twickenham Museum – a large canvas backdrop for their forthcoming exhibition commemorating the 100th anniversary of the Battle of the Somme. I worked with a lovely group of Year 9 students from St Richard Reynolds Catholic College, also in Twickenham, over two days. Day 1 began with a visit to the museum, after which we looked at the paintings of WW1 artist Paul Nash. Although Nash didn’t reach The Front until 1917, I felt his striking and intense battle-scarred landscapes would be a good starting point for the students. We then made collagraph plates by sticking string, rice and corrugated scraps onto cardboard – this was to represent barbed wire, shell explosions, and torn duckboards. 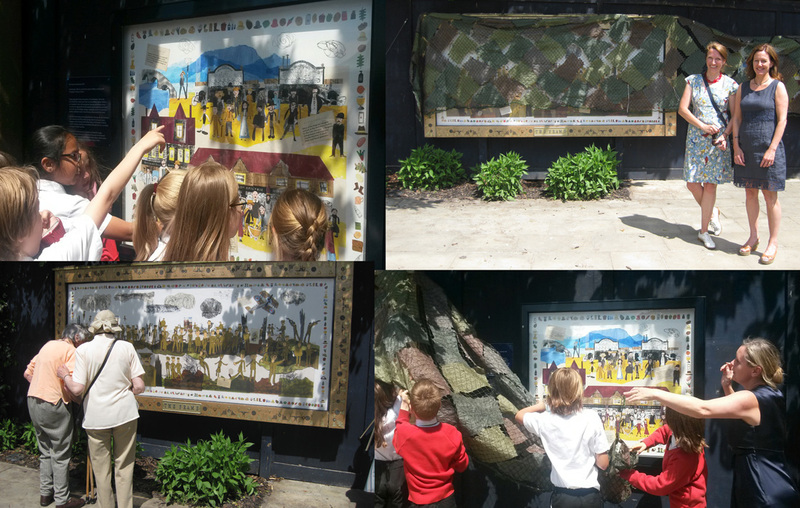 We then used mixed media to create a reduced scale collage to plan the composition for the final backdrop. Day 2 saw the students cutting blasted trees from black felt (sourced from the wonderful Work and Play scrapstore) and then getting stuck into some embroidery. I must admit I had wondered if this would be the least-favourite element for a group of teenagers, but in fact they couldn’t put those needles down, and the detail of the stitching on the trees is one of the best things about the finished work. We also printed the collagraph plates onto fabric – a mixture of linen, cotton and various satin samples in a muted colour palette. Keeping to the paper plan as much as possible, I then finished the piece by assembling on canvas with a mix of PVA glue and Bondaweb. Many thanks to Twickenham Museum for inviting me to take part in the project, to the Richmond Arts Team at Orleans House, and most of all to the staff and students at St Richard Reynolds Catholic College for all their enthusiasm, ideas and careful stitching. This entry was posted in collage, General news, sewing, Workshops on June 2, 2016 by Jane Porter. Last year I was lucky enough to be picked for a special training programme for new authors – 21st Century Authors – run by the National Literacy Trust and delivered by Author Profile. We covered all the stages of planning and delivering a school visit, from preparing the content to tips from an actor on how to stand and deliver. The final part of the programme was an actual school visit – and mine was yesterday, fortuitously on World Book Day, to Wessex Gardens Primary School in Brent Cross, north west London. Although I’ve led creative workshops in dozens of schools over the years, it’s the first time I have visited one as an author, so I was excited and a little apprehensive – I feel much more comfortable encouraging other people/children’s work than talking about myself. However I looked back through all my notes from the training, found the talk I had prepared, and realised I was actually ready. Best of all, although the publication date is still some way off, I was able to read the children my first picture book as author and illustrator, Pink Lion – a world premiere! The school, staff and especially the children couldn’t have been more welcoming. I spent the day with Year 1, talking about how I wrote the story with and developed the artwork – and was rewarded by a big spontaneous round of applause after I read the story out loud! Since the children were all dressed up for World Book Day, it was lovely to be told by the Mad Hatter, Robin Hood and several princesses that the book was a hit with them. 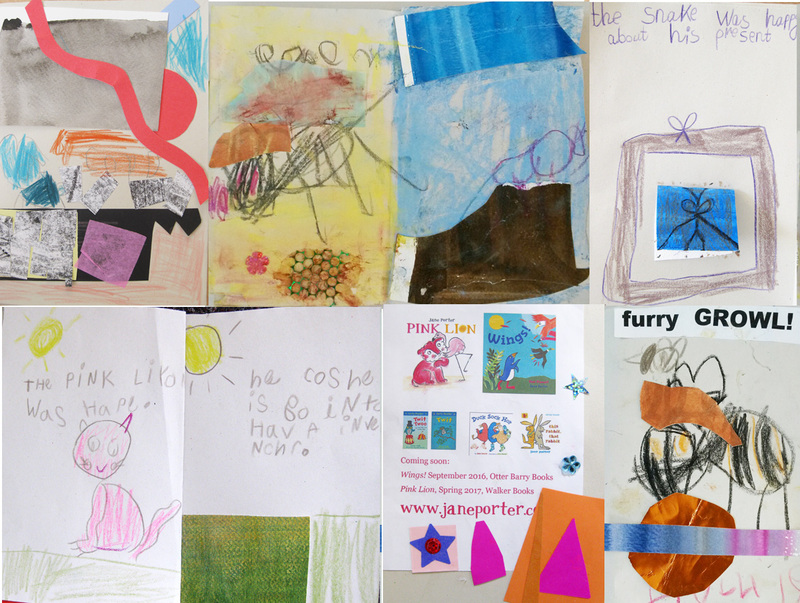 The remainder of the day was taken up with workshops – the children created their own stories using a mix of collage and drawing, with some very imaginative scenarios developing as well as gorgeous artwork. I love the idea of the snake being happy about his present – beneath the flap is a tiny, curled up sleeping bear. Nice to see my little flier getting embellished and incorporated into some of the books too! Huge thanks to NLT and Author Profile for preparing me so well for this event – may it be the first of many. This entry was posted in collage, drawing, General news, Workshops on March 4, 2016 by Jane Porter. After six months of research, planning, workshops and tonnes of scanning – it’s finally here! 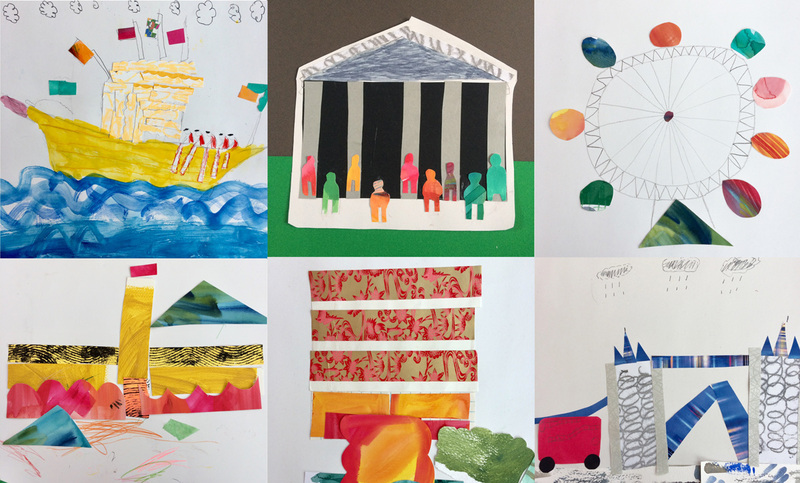 My community art project with Sue Edkins was launched yesterday at Diamond Jubilee Gardens, Twickenham, under a blazing hot sun with many of the participants – from age 8 to over 80 – there to see their work on public display for the first time. As I posted when we first began in January, the project is Twickenham’s version of the ‘Fourth Plinth’ – a public work of art that changes every couple of years. In Twickenham’s case, however, it also involves the community, and the work of many, many hands can be seen in the three finished pieces. Four classes of children from St Stephen’s Primary School took part, producing the most characterful set of drawings based on stories and postcards showing Twickenham’s involvement in WW1, from sporting heroes at The Front, to the Belgian refugee community, to Richmond Park as a training camp and convalescent hospital. They also made monoprinted textures, and experimented mixing paint to create panels for collage. 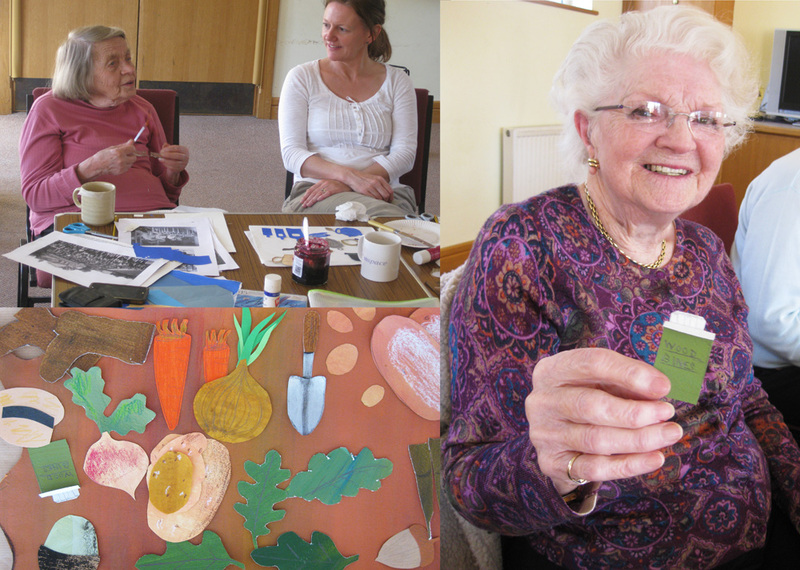 We also had a huge number of collage motifs, created by two groups of older people and also by members of the public who came to a drop-in workshop in the park. These form a decorative border around the three panels. With a red-hot scanner burning up from working so hard, we pieced together these hundreds of individual elements digitally to create three colour-keyed scenes telling the story of Twickenham’s War. The frames were appropriately covered up with camoflage netting to increase excitement as we waited for the big moment – then the children helped whisk off the net and then immediately rushed around spotting their own work – a lovely moment we’d been waiting for a long time! 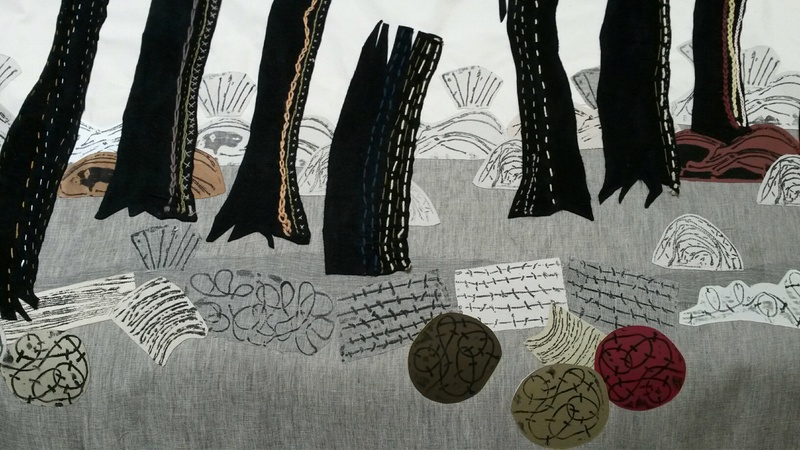 The work will be on display until 2018 when the centenary years of WW1 come to an end – so if you are near Twickenham, do go and take a look – there’s an excellent cafe in the park and a lovely river view into the bargain. Many thanks to the many people who made the project possible – to the Arts Team of the London Borough of Richmond upon Thames at Orleans House especially Rachel and Carla for commissioning us, giving us studio space and being fantastically supportive, to everyone who helped with the research, especially Helen Barker, and to Ruby, Anna, and Ashley who all helped with the workshops, to St Stephen’s Primary School for taking part so enthusiastically, and to the Greenwood Centre in Hampton and St Stephen’s Church Monday Fellowship Group for producing beautiful motifs. And finally to Jagon, Chris, Luke, Roger and Mark for helping install the work in Roger’s amazing Frame! This entry was posted in collage, drawing, General news, Illustration, murals, Workshops on June 27, 2015 by Jane Porter. 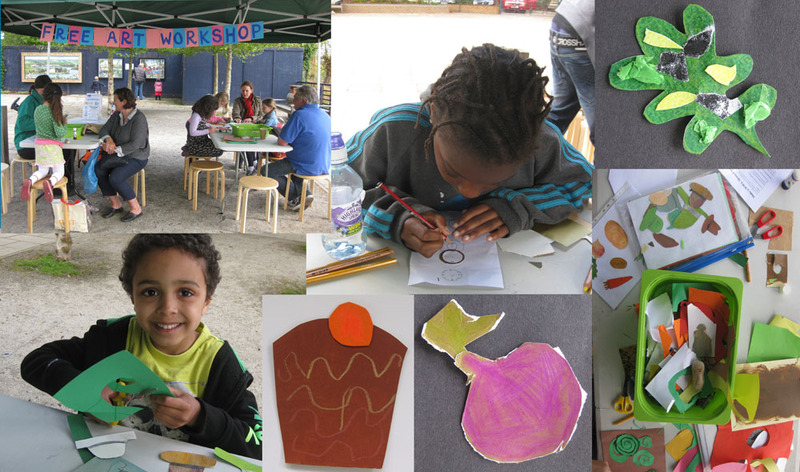 Yesterday Sue Edkins and I held a drop-in workshop at Diamond Jubilee Gardens, Twickenham – we invited passers-by and local families to come along and make a motif, inspired by one of our WW1 themes, to form a decorative border for the work we are making to go in The Frame in the park. Many thanks to Ashley for helping on the day, and to Jagon for helping move all the equipment from Orleans House and back into the cellar at the end of the day. This entry was posted in Workshops on April 26, 2015 by Jane Porter. Another drop of that squirty black stuff please! This week Sue Edkins and I have been at St Stephen’s Primary School, East Twickenham, running workshops with Year 4 and Year 5. It’s all part of our WW1 themed community art project, which will go on display in Diamond Jubilee Gardens, Twickenham, in June this year. The workshops have been great fun, with delightfully enthusiastic children and teachers. Activities divided into 3, with each child getting a chance to try them all – logistically complicated but feasible! The first was drawing, using wartime reference photographs; the second was painting – experimenting with mixing colours within a specified palette – we had some delicious ochres, mustards and khaki shades emerging simply from three primary colours and white. 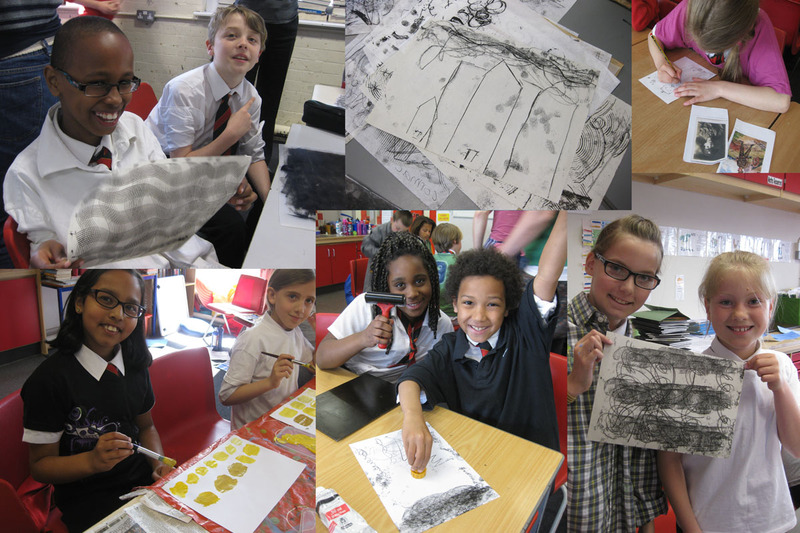 The final activity was monoprinting, which became strangely addictive: once shown the technique, children were given a variety of tools to experiment with mark-making, and they were very inventive in their approach. They were also intrigued by the huge tube of water-based block printing ink (the squirty stuff) and seemed to like the smell! Each class was making work related to a particular theme: the Belgian refugee community in East Twickenham, Twickenham’s sporting heroes at the Front; and Richmond Park during the war – all fascinating topics on which we were able to share our research from earlier in the year. We have two workshops still to do, and after that will spend some weeks collaging together all the work we have collected to make three finished images. Many thanks to Ruby, Anna and Tinah for their help. This entry was posted in collage, drawing, Workshops on April 24, 2015 by Jane Porter. I’ve just spent the afternoon at the Greenwood Centre, Hampton with some delightful ladies – members of the Will and Way Club (a craft and social club for seniors). It’s all part of The Frame community art project I’ve been working on all year with Sue Edkins for the London Borough of Richmond upon Thames’ Arts Team, and we have now reached the workshop stage. Two hours flew by chatting, eating some delicious home-made bread and jam brought by one of the members, and making motifs to form a border around the three images we’ll be making for Diamond Jubilee Gardens, inspired by Twickenham’s role in WW1. With a pile of coloured collage sheets and some reference pictures for inspiration, the ladies went to work making all sorts of items, from vegetables representing the allotments dug in Richmond Park to help feed a hungry population, to one of the tobacco tins Queen Mary issued to every soldier at the Front. The star item for me was a tiny packet of Woodbines made by Grace, who remembered people talking about ‘Woodbine Willie’ the priest who offered cigarettes as well as comfort to dying soldiers during the war. This week we’ve also been working with St Stephen’s Primary School making work for the project, but I’ll report on that in a separate post. This entry was posted in collage, Workshops on April 21, 2015 by Jane Porter.